During a recent Raffles Insurance Ltd. Board Meeting, Lincoln Builders, Inc. was presented the prestigious John A. Arnold – Award of Honor. Raffles recognizes, through an award system, outstanding achievement in safety and loss control. Lincoln Builders’ risk control efforts were successful in achieving the highest point score of the Raffles membership. Lincoln was also recognized for driving between 200,000 and 1 million miles with zero fleet accidents and was presented a Fleet Safety Award plaque. Lincoln Builders’ Safety and Loss Prevention Program is administered by safety director Johnny Gibson with support in claim management and reporting by insurance administrator Debbie Heard. This team, along with corporate management, trains Lincoln employees to think and practice safety on the jobsite and carry that practice home with them so their families may also learn the importance of safety. 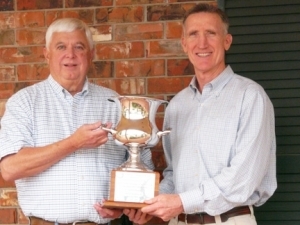 PHOTO: Danny Graham, Lincoln Builders’ CEO (right) and Johnny Gibson, Safety Director with the “traveling trophy,” which will be on display at Lincoln’s corporate office this year.